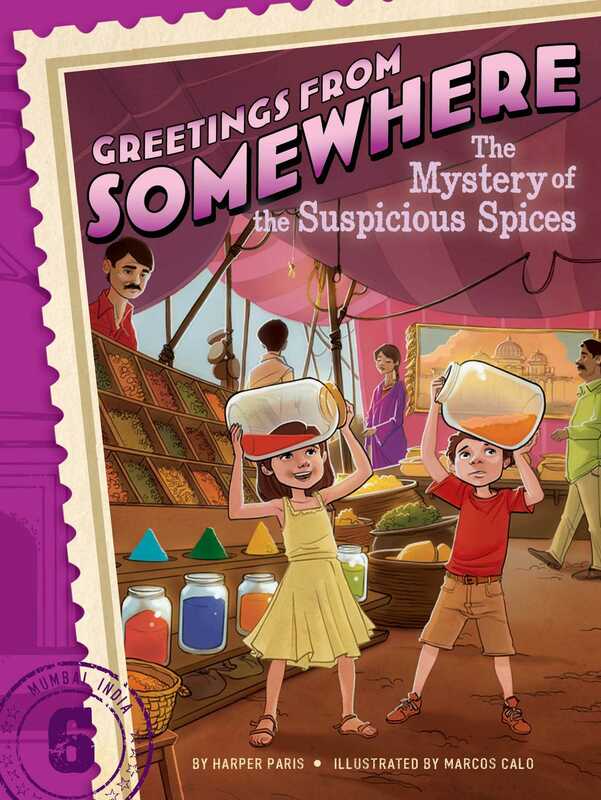 Ethan and Ella discover some suspicious spices in a market in Mumbai, India, in the sixth book of Greetings from Somewhere, an exciting series about mystery, travel, and adventure. Ethan and Ella venture into the bustling markets of Mumbai, India, where there are tons of beautiful sights and smells—from silky fabrics to bread being baked to jars of spices. When one of the spice sellers starts getting complaints about his saffron, he is beside himself. His spices have always been known to be the purest in the market. Ethan and Ella are on the case—and they soon discover that someone has been meddling with the spices! Mystery of the Suspicious Spices Chapter 1 A New Mystery? “This is the coolest castle I’ve ever seen!” Ethan Briar exclaimed. “An emperor named Shah Jahan built it in memory of his wife back in the sixteen hundreds,” their dad, Andy, explained. “Wow!” Ella stared in awe at the white marble building. It was really beautiful—and really big, too! The Taj Mahal was the latest stop on the Briar family’s trip across India. So far, they’d visited a tea plantation, a desert, and a snow-capped mountain. They had ridden on a small, old-fashioned train called a “toy train” that chugged up steep hills. They’d seen lots of temples, including one shaped like a giant stone frog. Tomorrow morning, they were flying to the city of Mumbai, which was on the Arabian Sea. Mrs. Briar was a travel writer for their hometown newspaper, the Brookeston Times. Her job was to write articles about interesting places all over the world. The Briars had already been to Venice, Italy; Paris, France; and Beijing, China. Their last adventure before India was a safari in Africa! While Mrs. Briar worked, Mr. Briar homeschooled Ethan and Ella in their second-grade lessons. “You forgot to take off the lens cap, Dad,” Ethan told him. Mr. Briar laughed. “Oh, right! Okay, here we go. Smile!” Click!